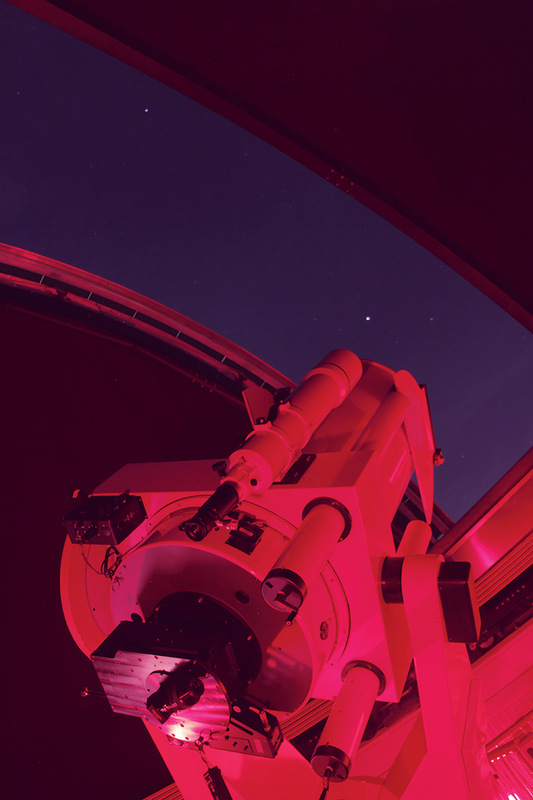 Austin College’s 24-inch research telescope, housed in the IDEA Center’s Adams Observatory, takes on a sculptural quality when photographed with a long exposure that captures the soft red glow of the dome’s nighttime infrared light. This image was captured during one of three “Star Parties” hosted by the Physics Department this past year. Visitors were treated to spectacular night sky viewing as explained by Dr. David Baker, director of Adams Observatory, and his physics faculty colleague Dr. David Whelan. Students in astronomy courses co-hosted the public events, pointing out additional features of the vast universe visible through smaller viewing telescopes set up on the IDEA Center roof and nearby College Green. Physics students also shared progress on current areas of research, including planetary sciences, astronomical imaging and photometry, and stellar spectroscopy. Stellar research, indeed!